In the early 1930s, with mines being developed on the southeast shore of Great Bear Lake (map), there was need for the establishment of a town in the area. A small sheltered bay off Echo Bay was examined by government surveyors and found to be ideal as a town site. Streets and lots were laid out and the new community was given the name Cameron Bay after Jack Cameron who had staked claims in the area in 1931. Cameron Bay was expected to grow very quickly and there were many business opportunities. One of the earliest businesses established was Murphy Services, a partnership made up of Gerry Murphy, Vic Ingraham, and Tim Ramsay. In the early spring of 1931 Murphy Services constructed a log building that would serve as a store, a post office and a mining office. They also had a sawmill at Sawmill Bay on McVicar Arm which provided timbers for the mines and lumber for new buildings. 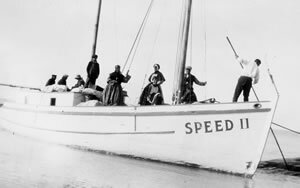 To transport supplies to their store and lumber and timber from their sawmill Murphy Services bought a schooner named Speed II and got into the freighting business. Murphy Services did well during its first few years but by 1933 mining activities, and the town of Cameron Bay, were on the decline. Many smaller businesses went bankrupt and Murphy Services was not far behind so to remain solvent Vic Ingraham began to use Speed II, pulling a thirty-five ton barge, to haul freight on Great Bear Lake for anyone willing to pay. On October 26, 1933 Ingraham was making the last trip of the season hauling freight and passengers from Fort Franklin (now Deline) to Cameron Bay. Harry Jebb was the engineer and Jimmy Potts and Stuart Currie were deckhands. The barge was loaded with barrels of fuel oil and gasoline but also had onboard six men who were headed for Cameron Bay hoping to find work. Weather during this crossing of Great Bear was very bad and both the schooner and the barge became covered in ice. Vic Ingraham was forced to cut the barge loose so they both wouldn’t sink. Shortly after Speed II ran out of fuel and gasoline had to be pumped from barrels carried in the hold. During the refueling process some of the gasoline was spilled and when Ingraham tried to restart the engine it backfired and ignited the spilled fuel. Jebb and Potts were trapped below and Ingraham and Currie attempted to rescue them but the fire was too intense. During this rescue attempt Ingraham severely burned his hands, feet and legs and was barely able to launch, with Currie, a rubber raft just before Speed II, with Harry Jebb and Jimmy Mypotts still trapped below, went to the bottom of Great Bear Lake. Ingraham and Currie now found themselves floating in Great Bear Lake in the middle of a raging storm but fortunately the wind was blowing onshore and they were soon tossed up on a snow covered beach. They knew the barge must also have been driven onto shore and with Currie half carrying the badly burned Ingraham they began to search. Luck was on their side as they quickly found the barge and found that the men who had been on the barge had already built a shelter and started a fire. For fourteen days Currie and the six passengers cared for Vic Ingraham until a search plane sent out from Cameron Bay found them. Vic Ingraham was examined by the doctor at Cameron Bay and flown to the Aklavik hospital where, to save his life, doctors amputated his legs and fingers. The loss of his legs and fingers didn’t seem to slow Ingraham down; he ended up, several years later, building and managing Yellowknife’s first hotel.